On November 1, 2017, the Inauguration Ceremony for the 35th President of the Jogye Order (Ven. Seoljeong) was held at Daeungjeon (大雄殿 Hall of the Great Hero) of Jogyesa. The following text is the inauguration speech delivered by Ven. Seoljeong, the newly appointed Jogye Order President. Honorable Supreme Patriarch Jinje Beopwon, Ven. Jongha, Chairman of the Council of Elders, and esteemed members of the monastic community who are dedicating themselves to putting the teachings of Mahayana Buddhism (spiritual practice and Dharma propagation) into practice! I pay my utmost respect to all of you. I would like to extend my sincere gratitude to Chairman Jeong Segyun of the National Assembly and distinguished guests for attending today’s Dharma assembly. Esteemed members of the monastic community and distinguished guests! Today, we all gathered here on the occasion of commemorating the beginning of the 35th presidency of the Jogye Order of Korean Buddhism. As the 35th President of the Jogye Order, I feel strong responsibilities. The Jogye Order has succeeded philosophies and cultural traditions of a 1,700-year-long history of Korean Buddhism with great emphasis on spiritual practice. As you all know, Buddhism has served as a spiritual sanctuary for Korean people through thick and thin ever since it was introduced to the Korean peninsula. Harmonization of disputes (和諍 hwajaeng) of Korean Buddhist principles played a pivotal role in society when it suffered from conflicts and division, while the members of the Korean Buddhist community contributed to protecting nation when there were foreign invasions and dire situations. Korean people have dedicatedly worked hard to make this country a pure land of Buddhism since the introduction of Buddhism. Environmental degradation was strictly avoided as it was strongly believed that all living beings had Buddhist nature and, therefore, they all should be respected. However, it is true that time-honored traditions and spiritual essence have been tarnished in the face of modernization. Now, we, the members of the monastic community, should be at the forefront of spiritual reform. We should light up the lantern of hopes for happiness of humankind through careful reflection, while taking pride in remarkable history and culture of Korean Buddhism. We clearly proved our fundamental strength by wisely overcoming challenges. Even in the face of unprecedented impeachment and imprisonment of the former president of the Republic of Korea, Korean people unwaveringly fulfilled their duties and enabled the new administration to be launched in a peaceful manner. All citizens have remained steadfast despite North Korea’s nuclear tests and missile launches, while calmly responding to rapidly changing world hegemony and orders. There have always been conflicts and confrontations regardless of time. In order to fundamentally eliminate these challenges, the quintessential teachings of Buddhism, such as harmonization of disputes and middle path, can provide solutions. If all of us can put the principles of mutual growth and harmony into practice and spread the teachings of the Buddha, I believe that every portion of the efforts will contribute to world peace and happiness of humankind. The source of pride of being a Buddhist lies not in the total number of believers but in the actual roles that Buddhism can play in society. The Jogye Order and Korean Buddhist community have numerous challenges ahead. Blaming each other in the monastic community without sense of respect for each other would be the most difficult challenge that we need to resolve. We should put an end to endless disputes and remind ourselves of the fact that we all are the disciples of the Buddha. 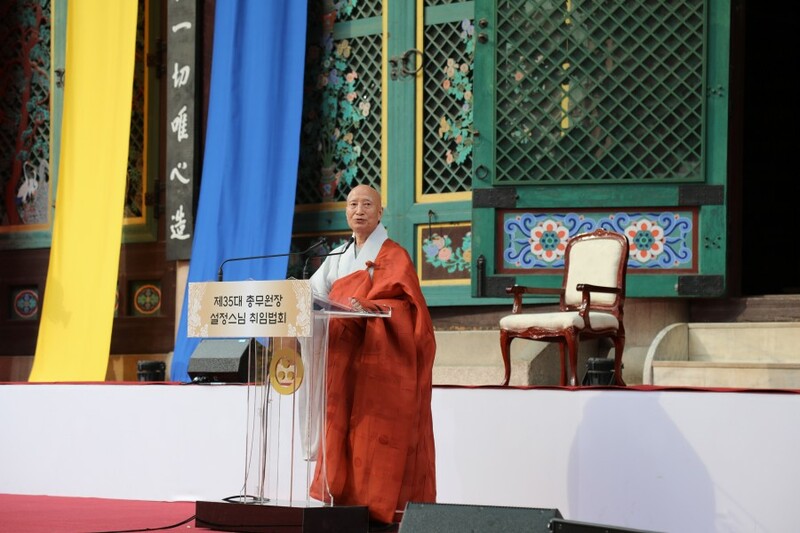 Throughout my campaign for the 35th presidency of the Jogye Order, I have highlighted the following pledges: first, enhancing the quintessential spirit of the monastic community, second, strengthening head district-led system, third, bottom-up reform of the Order, fourth, improvement of the Order’s administrative system, fifth, establishing pioneering policies on traditional culture of Buddhism, sixth, expanding and solidifying welfare system for Buddhist monks and nuns, seventh, systemizing education for the monastic community and nurturing talent, eighth, diversifying and improving Dharma propagation policies, ninth, letting the world know more about Korean Buddhism, and, finally, increasing the role of the Jogye Order in society and building public trust. The members of the 35th administrative body of the Jogye Order Headquarters are committed to realizing the pledges building on the achievement that has been made so far thanks to my predecessors. Above all, going back to the basics so that Buddhism can be the way it is and regaining public trust through enhanced capability of the Order in society will be my utmost priorities. To this end, I will work hard to build capacity of Buddhist monks and nuns so that they can well respond to changes in the religious community, to help local residents lead happier lives and to lead regional culture and arts. One of the challenging tasks includes reforming financial system of the Order which was established 50 years ago. The current dividend system, heavy dependence on the government budget and admission fees for cultural properties need to be resolved by collecting wisdom of the abbots of head district temples, members of the Central Council of the Order, public and experts. In addition, I intend to improve the current national policies on Buddhist traditional culture which regard sacred Buddhist treasures as mere “cultural properties”. In-depth dialogues, persuasive discussion and cooperation with government institutions will be necessary, however, I promise that I will never abandon upright principles. I will fully support the Bureau of Monastic Training and Bureau of Dharma Propagation so that they can accomplish their responsibilities more effectively, while expanding autonomy of each district, considering each district’s natural environment and circumstances. Furthermore, the welfare system for elderly monks and nuns which showed great progress during the former president’s term will be more advanced. Buddhist nuns will have more opportunities with which they can make the most use of their talent and capabilities. Distinguished guests, the members of the 35th administrative body of the Jogye Order will devote themselves to realizing the pledges, constantly reminding ourselves of the very reason we got ordained. However, our efforts alone cannot maintain and further advance of the Jogye Order and Korean Buddhist community. I ask for your continued interest and sincere advice so that mercy and wisdom of the Order can be spread throughout the world. I have always highlighted sincere aspiration, great vows and emptiness of mind throughout my life as a monastic. Buddhists without sincere aspiration and great vows cannot be regarded as true disciples of the Buddha, while monastics without emptiness of mind might be embroiled into conflicts. Members of the Jogye Order, including myself, will root out the causes of conflicts by regaining the sense of emptiness of mind. In this regard, I would like to highlight that we, the Jogye Order monastics, should be at the forefront of giving love and respecting others and purifying our mind. Distinguished guests, I understand that there were concerns and criticism over the process of the recent Jogye Order President election. I feel that my lack of virtue caused such troubles, so I will come up with the measures for great harmony and reunion by improving the culture of the Jogye Order election. Above all, equality and embracement of diverse opinions will be further emphasized so that all members can freely share their ideas. I sincerely ask for your understanding and cooperation in this regard. Lately, some regard “difference” as “wrongness”, leading to ignorance and hatred in society. As you all know, however, difference cannot be the standards for judgment. We, the members of the Buddhist community, should respect all people with different ideas and beliefs. I promise that I will be at the vanguard of ensuring harmony and building mutually beneficial partnership among religious communities and difference can be warmly embraced in the Jogye Order. The members of the 35th administrative body of the Jogye Order Headquarters are committed to regaining public and the monastic community’s trust by restoring the principles of spiritual practice and achieving harmony. Let us be the beacon of hope for the Jogye Order and Korean Buddhism. I would like to extend my sincere gratitude to all of you for being here today to celebrate my inauguration as the President of the Jogye Order despite your very busy schedule. May we all attain the Buddha.